Location: near Corbridge, Northumberland, England. Notes: Dilston Castle is a ruined 15th century tower house situated at Dilston, near Corbridge, Northumberland, England. It has Scheduled Ancient Monument and Grade I listed building protection. 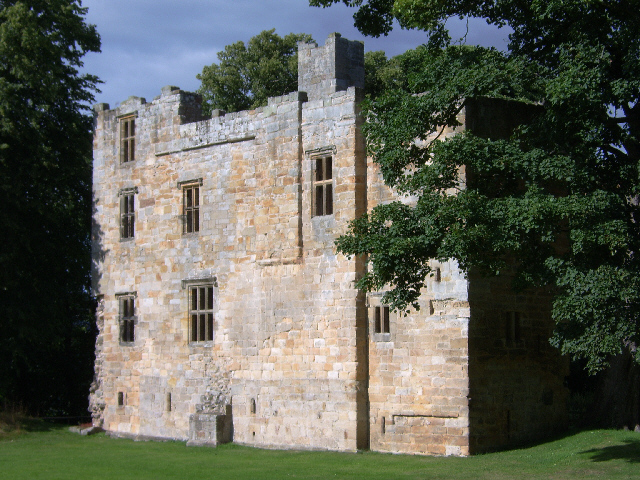 A three storey tower was built by Sir William Claxton on the site of an earlier pele tower in the 15th century. A restoration of the buildings began in 2001 and the castle was opened to the public in 2003 In 2004, 220,000 was awarded to begin work renovating the early 17th-century bridge (The Lord's Bridge) near the castle, as well as securing the survival of the Jacobean range of buildings with cobbled floor that share the grounds with the castle. The recent excavations have revealed the remains of the demolished Dilston Hall and its 17th-century service range and have also found evidence of medieval occupation of the site. The restorations of the castle, funded by the Heritage Lottery Fund, included work on a new roof, repointing, and the construction of a new floor, constructed of timber, and a staircase in the castle to access the upper levels. The castle also shares its grounds with a chapel, which is also protected under the same historic building laws as the castle. The castle is situated on the same grounds as Dilston College, a residential college for young adults with learning difficulties. The college was originally a maternity ward, until the Lord Rix changed it into the current learning difficulties college, having a daughter with LD himself.